Sunbury Sizzle & Sounds returns for its eighth year on Saturday. The festival will run from 11 a.m. to 11 p.m. in the village square. For more information, visit www.sunburysizzleandsounds.com. • 5K Trail Run/Walk Fishing Derby, 8615 Watkins Road, Ostrander, 9:30 a.m. to 3 p.m. Sunday. The Shelly Company, which manages five wildlife habitat sites throughout Ohio, will host a community event that includes a 5K trail. Registration at 9:30 a.m. with the fishing derby from noon to 3 p.m. Free lunch will be provided from 11:30 a.m. to 2 p.m.
• Ice cream social, Bicentennial Park, Delaware, 5:30-8 p.m. Sunday. Ohio Heartland Chorus will be serving baked goods, ice cream, hot dogs, root beer floats, and water for a donation to raise funds for music and costumes for their upcoming year. Delaware Community Band will share a concert at 5:30 and Three of a Kind will continue the music until 8 p.m. In case of rain, the event will be at the YMCA on South Houk Road. • Powell Cruise-In and Pig Out Car Show, downtown Powell, 10 a.m. to 4 p.m. Sunday. All vehicles welcome to enter the competition with more than 50 trophies plus Best of Show. Awards begin at 4 p.m. Proceeds benefit The Powell-Liberty Historical Society, the Justice League of Ohio, Powell Sertoma Club, Kiwanis Club of Powell, and Olentangy Rotary Clubs. For information, call 614-436-2000 or email l2559@columbus.rr.com. The Nut Job 2 (PG): [2 p.m.], 5 p.m., 8 p.m. The Dark Tower (PG-13): [2:15 p.m.], 5:15 p.m., 8:15 p.m. The Nut Job 2 (PG): 1 p.m., 4 p.m., 7 p.m. The Dark Tower (PG-13): 1:15 p.m., 4:15 p.m., 7:15 p.m. The village of Sunbury will celebrate the end of summer on Saturday. 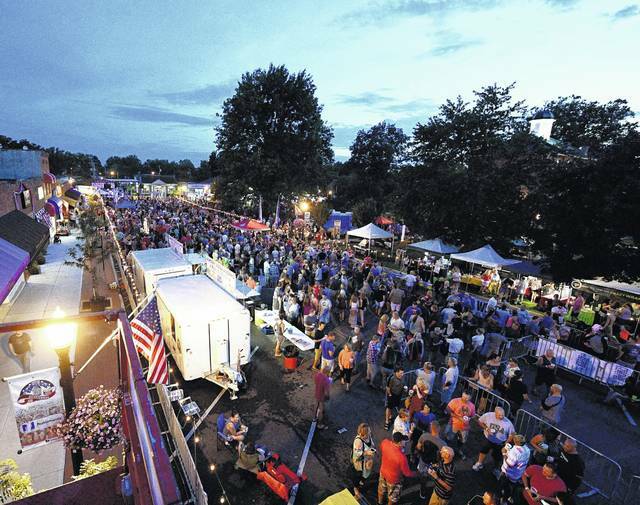 The Sunbury Sizzle & Sounds festival returns for its eighth year from 11 a.m. to 11 p.m. in the village square, according to its website. The family-friendly event features food and music for about 15,000 people throughout the day. Organized by the Big Walnut Civic Association, festival entertainment includes McGuffey Lane, Funky Waters, Simba Jordan Band, Fat Dog, and The Reaganomics. Columbus band LDNL will headline the event at 9:45 p.m.
Additionally, there will be a beer garden that will open at 2:30 p.m. with last call at 10:30 p.m. The garden will be located next to the stage. A kid zone will be open from 11 a.m. to 4 p.m. providing several activities including a petting zoo, giant slide, bounce houses, small carnival rides and bull riding. Festival goers have options to park for free around the village of Sunbury within walking distance of the square. Big Walnut High School will be open for festival parking. This year’s festival will feature two shuttle buses traveling throughout the community to pick up residents from neighborhoods every 20 minutes. A bus starting at PJ’s Original Family Restaurant, 571 W. Cherry St., will pick up festival goers at the following stops: North Miller Drive and Clifton Court; Sunbury Christian Church, 20 Rainbow Ave.; Morning and East Cherry streets; Sunbury Point Dental, 211 E. Granville St.; and North Vernon and East Cherry streets. The other bus starting at Big Walnut Grill, 175 State Route 3, will pick up people at the following stops: Sunbury Meadows Drive and Fox Creek Road, 109 Harrison and 70 N. Walnut streets in Galena, and Columbus and Granville streets in Sunbury. For more information, visit www.sunburysizzleandsounds.com.